Last week I was lucky enough to be invited to the launch of Stérimar Baby at Nobu in London. It was a product that I was unfamiliar with until then but one that I cannot wait to try in our household. When Isla was little she used to get so many colds and they played havoc with her routine, sleep was disrupted (for the whole family! ), she wouldn't drink her milk and once she started on solids she wouldn't eat. We have gone through a few different methods to help Isla when she's had colds, plug-ins, raising the head of her mattress and using menthol drops around her mattress and so we're willing to try things that will relieve congestion for Isla and for the new baby boy when he arrives! When the product was described to me I was intrigued as it's for clearing and unblocking little noses from birth to 3 years but it's made from 100% natural sea water! It's a concept that until I attended the launch and had it explained by Dr Catherine Hood, I wouldn't have considered. So, what's it all about? Well here's the 'science' bit (as they say in the ads! ): In young children the respiratory system is still in development and cannot fully protect the body against breathed-in contamination, making them more susceptible to colds. As babies mainly breathe through their nose and cannot blow it, a blocked nose can be so disruptive which then leads to problems with eating, breathing and sleeping. 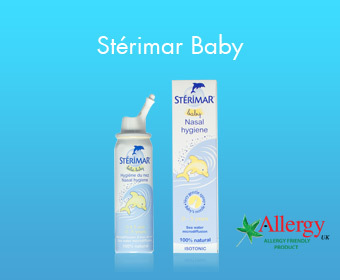 Stérimar works to gently unblock and clear little noses using sea water, with a reduced salt content for extra gentleness, a method that has apparently been common practice in France forever! It comes in a spray can with a special nozzle that has been designed to fit small noses. The nozzle is shaped so that it can be sprayed at any angle, which is handy if you have a wriggler like I have! Stérimar has no known side effects, is anti-histamine and steroid free. It also has no preservatives or additives. These are all really important things to consider when you're a mum as we all want to resist the urge to use lots of chemicals on our babies. Some people may be put off by the thought of using sea water but we were told that the water is pumped near oyster farms, offshore at high tide, no where near boat traffic nor pig breeding. These solutions have been used for many years in France and are also popular in South Africa, so if its good enough for them, then it's good enough for me! Stérimar is available from Boots and most pharmacies across the UK and I for one can't wait to give it a go and see if it makes life in our family a bit easier when our little ones have colds.